I turned 35 on Friday, and it was one of the best days of my life. It started out with Eric sending me to spend the day with my mom at the rehabilitation center. During the one-hour drive there, I was thinking about a list of questions I had written down--things I was hoping the Lord would help me to understand. This process of simplifying and living by my deeper yes hasn't been as smooth as I'd hoped it would be. I am continually stretched too thin, I feel like I'm always letting people down, and I constantly feel like my efforts don't measure up to where I think they should be. Though I felt a sweetness during the drive and an immense feeling of support, I didn't receive any specific answers to my questions. When I arrived at the center, I practically leaped out of the car and couldn't wait to spend time with my family. My dad, my sister Laura, and our neighbor Barbara joined us. Laura brought a lovely lunch, my dad brought chocolate-covered ice cream bars, and we had such a nice party there in the courtyard. I sat next to my mom and held her hand as much as I could. She was quiet, but happy. 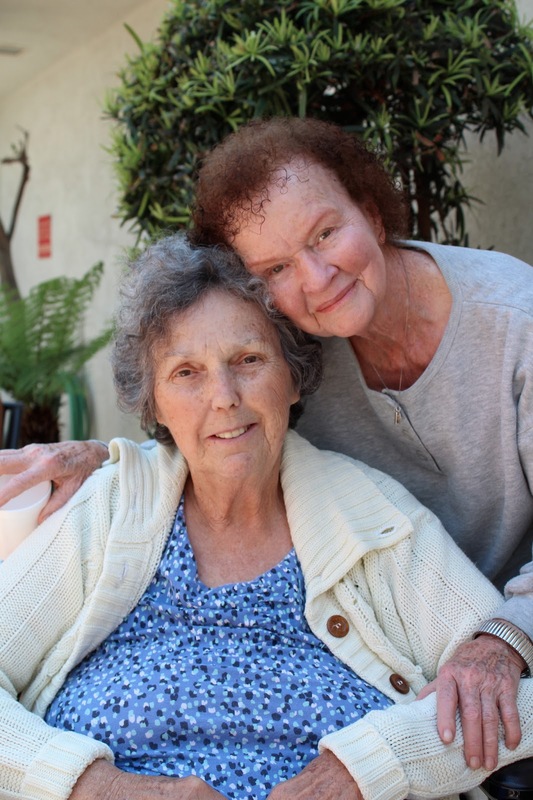 This is my mom and our neighbor Barbara--who has known my family for more than 50 years. She told me all about what a fussy baby I was and how my mother could NEVER put me down. She's such a good friend to our family. After lunch, Barbara and my dad had to leave, and Laura and I wheeled Mom into the lounge area. We've been worried about Mom lately because she has been crying a lot and asking over and over again when she can go home. But on Friday, she was calm and happy--totally at ease. A nurse asked me, "Has your mom always this sweet?" She said that sometimes when people get dementia, their personalities change. I assured her that my mother was the nicest person anyone could ever meet and explained how she raised us with the most beautiful, patient love. The nurse then told me that everyone there at the facility loves my mom. I was glad to hear that, and as I wheeled my mom around, I could see her in action. Whenever we passed another resident in the hallway, she would wave and smile or reach out her arm to pat him or her on the shoulder. When a nurse helped her use the restroom, she hugged her and said, "Oh, thank you for taking care of me." My mom doesn't have any boundaries when it comes to showing love and concern for others. She gives it to everyone. Now there are two very special things about the visit that I feel I can share here. The first was a sweet experience I had while my mom and I were sitting in the lobby together. Laura had gone to take the lunch tray back to the kitchen, and as I sat next to my mom with my arms wrapped around her, she started speaking very quietly--almost indistinctly. I listened closer, and I could hear that she was giving me counsel and advice. I soon realized that in her calm, encouraging, beautiful voice, she was answering the exact questions I had written down for the Lord that morning. I won't record the specifics because it was too sacred, but this was one of the most precious gifts I have ever received in my entire life. My mom has had dementia for pretty much the entire time I have been running Power of Moms. She doesn't know how to use the Internet, and she isn't involved in my day-to-day life. But as we sat together, and as she talked to me about my responsibilities, my choices, my struggles, my heart, my goals, and my daily work with my family and with Power of Moms, it was as though she knew everything. I can't even think about the experience without getting choked up. No one besides the Lord could have known what to say to me, and He chose to deliver that message through the voice of the one I needed to hear it from the most. I hesitated to even write anything about this experience here--because some things are just so special that you don't want to put them out in front of the world. But in this case, I feel like He wants me to share this so that if you are struggling, you will know that He is aware of you, too. I have zero doubt in the Lord's capacity to perform miracles. I know He loves all of His children--from every religion and background. He knows we all make mistakes and that we struggle and that we need help. And when we turn to Him, He has a limitless ability to supply everything we need. I am doing my best to remember this during the days that feel so hard. 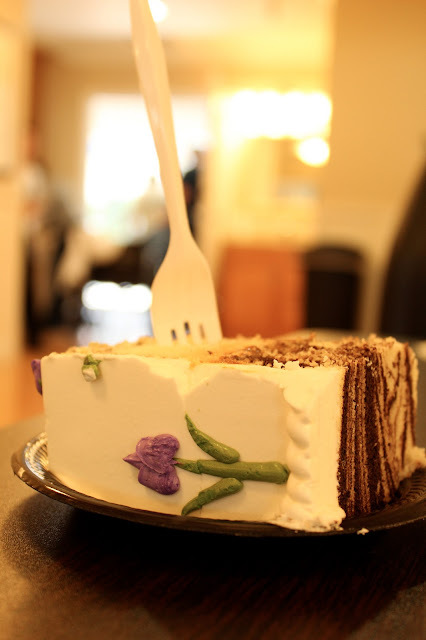 The second thing I want to record about my experience with my mom is that they served birthday cake that day. I asked the nurses if they always serve cake on the 19th, and they said no, that it changes every month, but that I could find the date on the main calendar. Then it struck me that this was a tender mercy from the Lord. On my birthday, when I got to go spend the day with my mom--who I miss so much--He arranged for them to have cake. Have you ever heard how "Coincidence is God's way of remaining anonymous"? There were a few other sweet experiences I may share later, but as I drove home, and as I went out to dinner with my husband and children that night (except for cute Ethan, who I said could go to a friend's birthday party), I felt lifted--and so grateful for this life. Thank you so much for your friendship and your love and concern for me. I so appreciate you. I loved this! Thanks for sharing it! I have had loved ones struggle with dementia and Alzheimer's. Wow. Your story really struck close to home. Such a sacred, special time. There are just no words. Thank you so much for sharing as much as you did. Treasure every moment! I'm so happy for you April. What a tender mercy. I thought of you on Friday as I ran right through your area in the Ragnar. I loved reading about your special birthday experience with your sweet Mother! You are an amazing person, April, and you deserved this beautiful tender mercy from the Lord. Thank-you for letting us all share some of what you felt. Love you! A beautiful post. Thank you so much for sharing it. I think you and your mom are gifted with a great ability to pass on love. This is so beautiful! I am so happy you had that experience with your Mom, you deserve all the beautiful and happy things coming your way! You are your Mother's daughter because you are so loving and sweet! This brought tears to my eyes. Thank you for sharing it. Happy Birthday my friend! Such a wonderful experience for our loving Heavenly Father to provide for you. He does know us. I know how this must have felt. My mom has a slow-growing form of Alzheimer's. Oh April, what a beautiful post. You are an amazing person. I am glad you had such a meaningful and sweet birthday. Thank you for sharing who you are and what you learn! Happy Birthday! I'm so glad that you were able to have that special day with your mom and have your prayers answered. I completely understand about some things being too sacred to share, but thank you so much for sharing the little bit that you did. I needed that reminder that the Lord is aware of us and we need to go to him in prayer with our questions and struggles. Often.